underground reservoir of water or pond contained by a waterproof container or liner below the surface of the soil. Plants are productive because they have a continuous supply of water and nutrients." Water once a week in summer and less during the rest of the year! Water won't evaporate in the reservoir under wicking beds. Instead, the water 'wicks' up to the roots, and the top soil will remain soft under the mulch. Since water will wick up only 300mm to the plant roots, the soil depth should be no more than 320mm deep (about one foot deep). Purchase this fully illustrated instructional eBooklet. 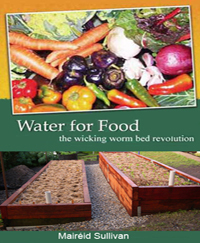 The wicking worm bed revolution"
This booklet provides detailed information, including exact measurements and lists of materials needed for constructing timber-framed Wicking Worm Beds, plus everything you need to know about adding compost worms to the wicking beds. We will email the book in PDF format within 24 hours. 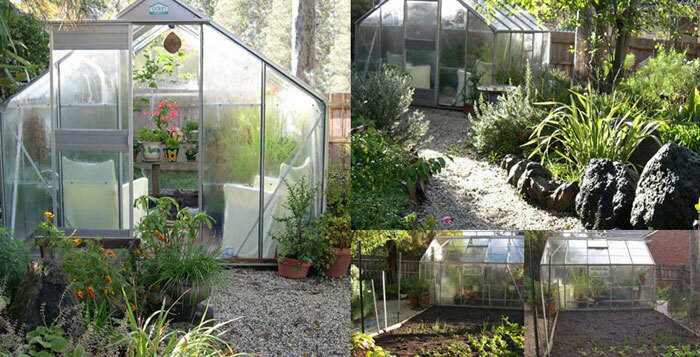 We built our first two 5x1 meter wicking beds in 2009 (now four), on the northern side of the house, so they get plenty of full sun, from morning to late afternoon, throughout the year -- in Melbourne, Australia. Most of our root veggie are grown in-ground: garlic, radishes, beetroot, carrots, onions - as well as strawberries. We use the above-ground wicking beds for various 'greens' - lettuces, spinach, tomatoes, beans, peas, bok choy, spring onions, herbs, etc. - varying from season to season. The in-ground beds are on the western side of the garden, facing north, for year-round afternoon sun, and situated next to the (8x10 ft) Eden Glasshouse, which we saved from demolition by my mother's new neighbour. A third of the internal space is for sitting - a fantastic place to escape to in the middle of a sunny winter day - cold outside and so warm inside. Compost worms maintain a free source of nutrient-rich diet for plants, depending on the quality of the food scraps fed to them, and they provide a very good structure to the soil, keeping nutrients available by slow-release, and helping to retain water. Microorganisms formed in a worm’s gut bind raw minerals from the soil to certain organic acids or sugars in a process called chelation. Plants can easily absorb these chelated forms of minerals. Worm castings are thought to contain a chitinase-enzyme, which melts the chitin that most insect exo-skeletons are made of. Worm castings act as a pest repellent/pesticide and act as a line of defense against pathogenic bacteria and fungi. Composting worms will turn anything that was once alive into compost. Worm castings provide a high quality fertilizer, including calcium, magnesium, nitrogen, potassium & phosphorus and a broad spectrum of trace elements. We use large plastic planter pots for our in-bed 'bio-boxes', aka a worm farm. These pots are the same plastic density as the commercially available worm farms which we've stopped using because, tragically, on one very hot day the worms melted! We've removed the base of the pot so that the worms can freely move from soil to compost. We use a slightly larger pot tray as a lid, with many small ventilation holes, -with a stone on top to keep the lid on. It is easy to maintain a compost bio-box directly on the wicking bed, where bacteria, fungi, and worms can breed up and re-fertilize the soil. An in-ground bio-box makes it easier to regularly top up with organic waste, directly from the kitchen and the garden, and especially convenient while picking food for the table. p. 16. 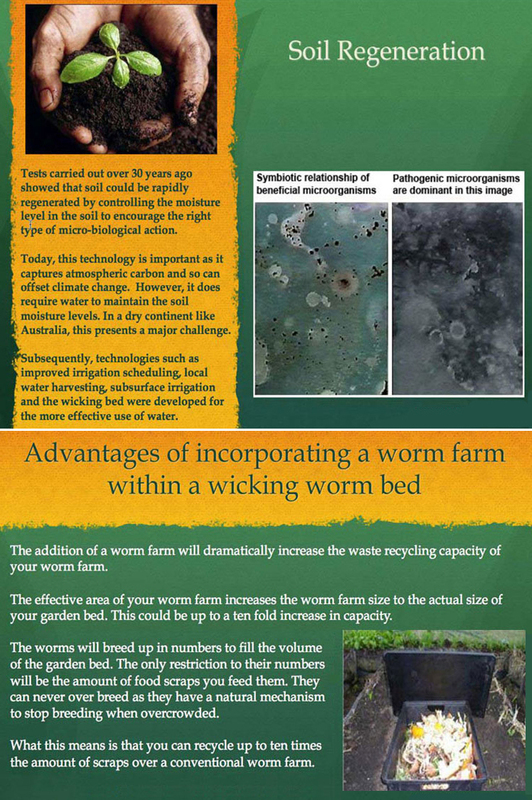 Using a worm farm or Bio Box can dramatically increase compost recycling, creating a rich organic blend of nutrients and trace elements high in humates, beneficial bacteria and fungi, ideal for plant growth & soil conditioning, that will enhance the flavour and quality of your back yard produced vegetables. The effective area of your worm farm increases the worm farm size to the actual size of your garden bed. This could be up to a ten-fold increase in capacity. The worms will reproduce to fill the volume of the garden bed. The only restriction to their numbers will be the amount of food scraps you feed them. They can never over breed as they have a natural mechanism to stop breeding when overcrowded. What this means is that you can recycle up to ten times the amount of scraps over a conventional worm farm. p. 17. When you see two dozen worms per shovel full of soil, the worms will maintain the soil quality for you. p. 18. It is now over a decade since the wicking bed concept was developed and the first bed installed. Since that time numerous environmentally sensitive growers have confirmed water saving and improved productivity. The reduced waste of nutrient-rich water to the water table is self-evident. The improved soil quality is evident to growers with a feel for soils, so there is little doubt that the organic content of the soil is increasing. Well we have great debates here on this issue of the best depth for the water and soil. Peter (of easygrowvegetables.com) and my neighbour and I spend many hours over a bottle of red wine arguing this point. If you do not like my answer write to Peter (pva36152@bigpond.net.au) and you will get a different view. What we do agree on is that water will only wick up some 300 mm. In my early experiments, I had my holes much higher than Peter but I watered until it reaches the holes then I don't water again until all the water has gone. This means that the roots are only in saturated water for a short time. This seems to work fine if the beds are not regularly flooded by rain. We may get a couple of weeks when it rains every day and submersing the roots for that length of time is definitely not good. Peter had his holes much lower to avoid getting the roots saturated. Now we are making our beds deeper with about 300mm of soil above the high water line. Using the shade cloth, this avoids any problem with water logging. What we are debating now is how deep we can make the water reservoir. Out last lot of beds were 500mm overall giving 200mm for the water reservoir and 300mm for the soil bed. This is working fine. I think that we could make the water reservoir a little deeper still. This cuts down the time between watering. On the latest bed I tried 300m and 300mm. Before, when we had to dig the trench, making it deeper was hard work. Now that we're using raised beds digging is not so much of a problem. Because I am old the last bed I made I dug out all the top soil (about 300mm) then made the raised bed a further 300mm which was quite quick to make. I have only just put the seeds in so do not know how it will work but I am optimistic. I will let you know how it goes. Sorry, there is not a simple answer. It also depends on what you are growing. I guess if you are after a rule of thumb make the soil layer equal to the natural root depth of the plant (for veggies about 300mm) and then decide the depth of the reservoir on how long you want between irrigations, but you will be lucky to get any benefit above 300mm.